Based on my experience I am giving you the ways to search pharma jobs. After getting known this information, if you try genuinely, definitely you will get the job. Along with the information am also providing the required urls (uniform resource locator). So that you can easily redirect to that pages or websites etc. 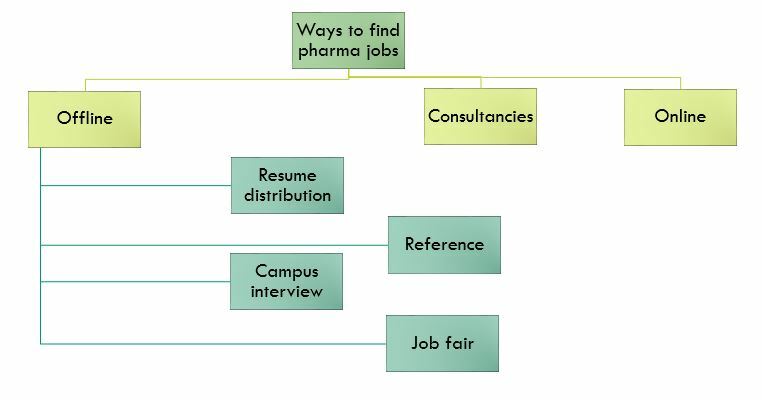 Methods to search pharma jobs can be divided as shown below. First of all we will go through the offline ways, it does not necessarily mean that you are not using help of internet, but it means the major work done through offline. In this method, you will approach your senior/relative/friend who are already working in the pharmaceutical industry. You provide them your resume, they will forward it to Human Resource (HR) department. You will get an interview opportunity, if you succeed, you will get the job. Story ends. You have to take print outs of your resume. You have to go pharma industrial area (where you will find at least 10-20 pharmaceutical companies) and give your resume to front office/security office. If they have any urgent /bulk requirement with your qualification, you will get an interview call. If you are okay in interview you will get the job. Story ends. Note: This is a tedious process. If you want to try this method, definitely you should go to any pharma/biotech industrial area on bike only. If you go on public transport, you can’t give more than 5/6 resumes in a day because pharmaceutical companies/plants are located far away from its next pharma company usually (200-400 meters distance from its next company). Some companies will not allow you to submit the resume. This is the worst experience we have ever faced. If your college is good and have relationships with the employers, your first interview call will be offered from your college itself. But this percentage is very less. These are usually conducted by Non profit organisations or colleges. Any body can attend this job or sometimes registration should be done. Care should be taken in job fair if you are going to pay money. There is no specific job fair conducted for only pharma people point of view. Pharma specific job fairs are rare. Job fairs usually conducted on colleges or grounds on specified dates. Due to large number of students, they don’t have time to take interview. They will take resumes or contact numbers. Most of the times, non-technical jobs will be recruited by this way. If you need a technical job suitable for your qualification, you have to try other methods. This a paid method. Other discussed methods in this website are free to use and there is no involvement of third party person apart from you and employer. Choosing a good consultancy is important in this method. Job consultancies has it’s own advantages and disadvantages. You need not to do anything to get an interview call. You will have freedom to choose your interested department. No need to strain more to get the reference. There is a chance of cheating (For ex. Consultancies should have an official tie up with the employers. Some consultancies have an individual tie-ups with HOD/HRs (this is not a correct way) to recruit the employees. If everything goes good, no problem. Other wise recruited employees will be treated as a back door employee). Note: If you are preferring this method, try to pay major portion of the charged amount after receiving the first month salary only. If you get the salary on time like other employees, It is a sign of official confirmation from your employer. This is the first part of how to search pharma jobs. Next part of ‘how to search pharma jobs’ discuss the online ways to search the pharma jobs. If you like this article, please share this article to your friends.